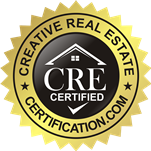 Crown molding refers to any kind of molding applied to a finished edge. The effect of molding is a create a graceful, elegant shape. 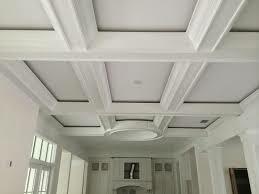 Crown molding appears in cabinets, walls, cornices, pilasters, and as trim where walls meet ceilings. As a decorative transition point between wall and ceiling, crown molding draws the eye upwards, creating length, while its continuous band unifies a room’s space. Installing quality crown molding is an easy way to add value to a home, and can be done relatively inexpensively for those who wish to do it themselves. However, choosing crown molding to match a room can be a daunting task. Issues of material, size, profile (the molding’s shape as viewed from an end), and color may overwhelm homeowners who lack experience with crown molding. Fortunately, the general consensus is that there are usually at least a few, if not several, options that work for any given room. The main thing to keep in mind is proportion, style, and the desired effect. Armed with a little bit of knowledge, homeowners can allow their imaginations to dream up the right crown molding for their room. A crown molding’s “type” refers to its material. There are several basic types, the most common of which are wood, medium-density fiberboard (MDF), polyurethane, and plaster. 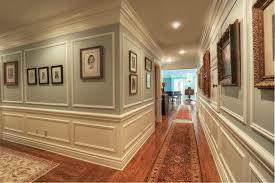 Wood is the most popular material for crown molding. There is a range of wood species available, including mahogany, oak, and pine. Wood crown molding comes in a variety of profiles, and it can be clear-coated, stained, veneered, or painted, depending on the species. The problem with wood crown molding installation is that wood is often sensitive to shifts in temperature and humidity, which can cause it to expand, shrink, or crack. Pine is the most widely-used type of wood crown molding. This softwood often comes pretreated to make the finishing process easy. Pine has a pale color and fine grain that gives it a rustic look. Oak is a hardwood that is best when clear-coated, varnished, or stained to highlight its rich, unique, pronounced grain. Like oak, other woods such as maple, mahogany, cedar, and hemlock are used in crown molding. They are generally unpainted, exhibiting the natural beauty of the wood itself. Medium-density fiberboard, or MDF, is a composite of sawdust fibers and resin. MDF crown molding comes in a range of profiles. It is excellent as a painted trim, but also comes with wood veneer for those looking for a wood finish. It is less expensive than traditional wood crown molding, and less susceptible to shrinking, expanding, and cracking than wood. Polyurethane crown molding has several advantages over wood that may make it a more desirable choice. Unlike wood, which may warp, expand, contract, or crack with changes in climate, polyurethane is not susceptible to alterations in temperature or humidity. This makes it a better, more durable choice for areas subject to significant climate variations. 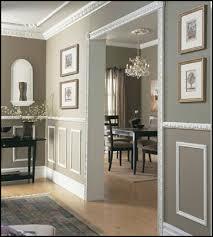 The disadvantages of polyurethane crown molding are that it is only available painted, and that it dents easily. A crown molding’s width is the measurement from the uppermost point it reaches on the ceiling to the lowest point it reaches on the wall. The proper width of a crown molding is determined by the dimensions of the room, in particular the ceiling height. Generally speaking, the larger the room, the wider the crown molding should be. The following table should help buyers find a target width for a given room. When it comes to choosing a crown molding color, there are no hard and fast rules. Some decorators insist that the crown molding be a different color from the walls. Dark molding against pale walls, for example, creates a dramatic look. Pale paint best highlights profile details through the interplay of shadow and light. Perhaps the only rule regarding crown molding is that if other trim is present, such as baseboards or wainscoting, molding and trim should match. The profile, or how molding looks when viewed from the side, is another important consideration. Profiles range from highly ornate to clean and modern. Much depends on the space. For large, traditionally-furnished rooms, ornate molding works well. On the other hand, a mid-century design house may only be suited to a flat-profiled molding. I prefer plaster crown molding. Like the article says, it just looks better. I think the other types look kind of cheap, but that’s my opinion. 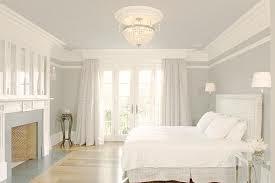 I do think it is great that there are other options for crown molding besides plaster, making the look affordable to almost anyone, with any budget. I agree, if you have the money, plaster is the way to go. If not, my next go-to would be the medium-density fiberboard. I’ve had that in one of my houses before, and it looked great. Small architectural details such as crown molding, or ceiling medallions, really make a difference in the home.